One of the most popular strategies in entrepreneurship is the idea of a minimum viable product (MVP) popularized by the Lean Startup Methodology. In another lesson, we talk about how to add to the Lean Startup Methodology with the concept of a Minimum Viable Segment (MVS). However, it’s also important to start out even more basic than your MVP, with your CORE Value. An MVP is based around the idea that when starting your business, you should start with a small, repeatable product in order to gain traction before expanding to add other features and products. An MVP has to be small enough to be achievable and to prove your value proposition and the CORE Value to customers, and viable enough that people will purchase it. This all requires focusing on your CORE Value before even building out your MVP and go-to-market strategy. Focusing on your CORE will allow you to minimize waste, and validate your idea sooner. Your CORE Value is your Capability of Really Exceptional Value. Many entrepreneurs have huge visions for their startups, and while ambition is important for entrepreneurs, it’s also necessary to make sure that you focus on the key element or elements of your value proposition that no one else has built in order to build a strong foundation for your business. Your Capability of Really Exceptional Value is what you can build, uniquely, that no one else can build. If you can outsource or partner with someone else for part of your product, it lies outside of your CORE Value. Imagine that you’ve designed the most amazing backpack in the world. Everything from the straps to the pockets are the most perfect aspects of a backpack ever designed. Then, when you go to sell it online, you spend money and time building your own e-commerce platform! What’s wrong with this situation? You weren’t focusing on your CORE Value. Here, your CORE Value is the backpack: something that you, the entrepreneur, created that’s unique. No one has ever built a backpack like this before! But building an e-commerce platform? That’s something that other companies have created. Instead of building out that technology on your own, you can focus on your CORE Value by partnering with another company to provide that for you. This will save time, money, and other resources so that you can keep building your backpacks. Your MVP will include the outsourced e-commerce platform that allows you to sell your backpacks, the companies that package your backpacks, and the distribution organizations that deliver it to your customers. Your MVP is everything you need to sell your product - but your CORE is everything you build on your own. Just as we said, focusing on your CORE Value will help you conserve resources that are better spent building up your product to be exceptional and valuable to the customer. Don’t reinvent the wheel! Only build what you, the unique and individual entrepreneur, should build! Compound on saving these resources by co-creating value. The key here is to forget everything but your CORE. Without focusing on your CORE Value, you may build too many unnecessary features or other products. You’ll often confuse your customers, or confuse your business, and end up going down paths that will waste resources like time, money, and manpower. Instead, you’ll want to find your CORE value, and build only that one exceptional capability in order to quickly validate your idea. Once you know what your core is, and you know that it’s unique, build it using resources like open source projects to minimize your overhead. At the bare minimum, even if you don’t find any open source projects related to your CORE, be open and extensible so that other people can build around your core. How am I going to monetize my CORE Value? What can I do to make my CORE disruptive in terms of how I monetize it? How can I take my CORE and do something other people are not doing? How can I use my CORE to my competitive advantage? 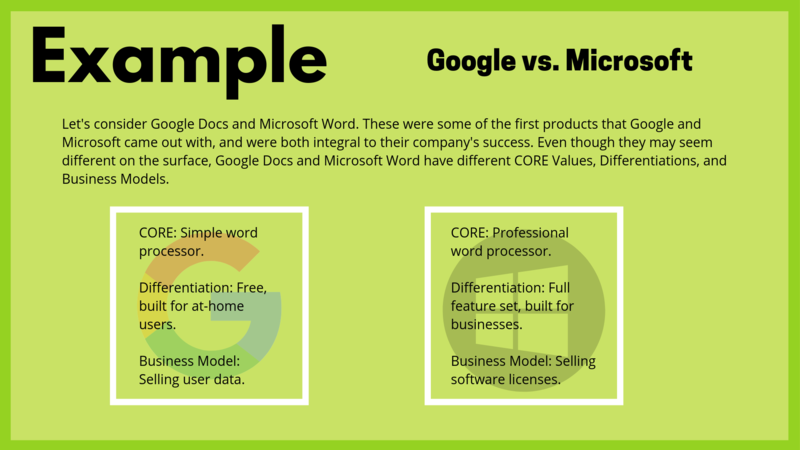 If you’re not sure where to start with your business model, check out our lesson on business models. If you want to learn more about how to be disruptive, head over to our lesson on unique differentiation. When you’re considering building a business model onto your CORE Value, always make sure to be consulting your customers. You’d be surprised at what great advice they can give! If you’re focusing on your CORE Value to your customers, they’ll be able to help you build a business that really meets their needs. Focusing on your CORE Value is the perfect way to start building your first product, and the foundation for your entire business. This focus will clarify your value proposition and segments while also helping you validate your idea without wasting resources. The next step is certainly finding your MVP, a great method for building your business up step by step. Need help figuring out your CORE Value? Still confused about how it’s different from MVP? 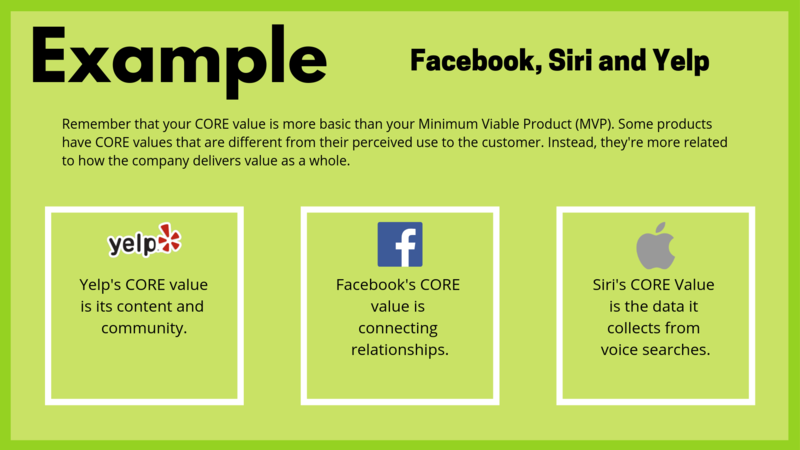 Head over to our forums for questions and discussions on CORE Value. For more on CORE Value, check out our workshop on Game-Changing Business Models. Advice: Talk to your customers! This lesson walks through the process of ideation and creation for your products, and how to reduce resource spend with co-creation.